This means optimism may be justified – if only because it suggests that the Eurozone has a great central banker who is both a serious economist and an astute politician. Within one week, a Summit agreed to set up a fiscal compact and the Treaty on Stability, Coordination and Governance in the EMU, the compact’s official name, was signed on 1 March 2012. It is now under ratification. The ECB then delivered. By end December, it started its massive liquidity support for Eurozone banks – the LTRO (Long Term Refinancing Operation). Bond spreads that were rising fast in December promptly declined, albeit temporarily. As explained in Wyplosz (2012), the ECB’s move was unconvincing because it was explicitly limited in time – but, crucially, not in amounts – and it relied on commercial banks to do the ECB’s job of buying public debts. Yet, it represented a major step in resolving the crisis. * It pushed governments to move away from the the Stability and Growth Pact approach to fiscal discipline whose centralization doomed it to failure. Instead, the compact introduces a decentralised approach whereby each country adopts its own institutions designed to make fiscal discipline a legal and enforceable obligation. 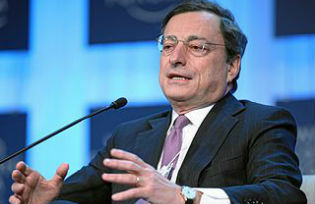 * It showed that the ECB was accepting its role as lender in last of resort to governments. For political reasons, it was done indirectly through banks, but the signal was unmistakable. The issue came up four weeks later at the next European Summit meeting. It is being actively debated. Although the term is vague and therefore open to much watering down, the prospect of a single European bank supervisor, a long-rejected yet indispensable element of a monetary union, is now on track. The risk is that politics prevent giving the supervisor bank resolution power, an equally indispensable step. Still, in a matter of days, Draghi has made some form of banking union unavoidable. The carrot that he dangled when he mentioned “a big pot of money” is the ECB acting as a lender of last resort to banks. The deal is clear, and exactly right. The ball is in the hands of governments. The latest statement signals that the ECB is now determined to act as lender in last resort to governments. * Require what it takes to alleviate the moral hazard that it entails. Put differently, Draghi is willing to backstop public debts to restore the effectiveness of monetary policy. This would indeed bring us close to the end of the crisis. What did he ask in return? Apparently nothing. This time around, he seems to be sending a warning to the policymakers that have long opposed any step in that direction, arguing that the treaties do not permit it. * By stating that preservation of the euro is an ECB obligation, he indicated that he will have no choice but “to do whatever it takes”. * He is asking Chancellor Merkel to prepare the German polity for the day when the ECB will make its move. Here he has political cover. Every single summit since 2010 has repeated – and this quite formally and explicitly – that Eurozone leaders are ready to do whatever it takes to preserve the euro. The time to deliver is coming. This will be a gigantic political challenge for Merkel, but in many cases she has already changed her position in front of pressing danger (calling the IMF to the rescue, creating the EFSF, making it permanent with the ESM, letting Greece default, etc). Optimism may become justified now, if indeed the ECB is in the hands of serious economists and astute politicians. But then there always is a risk of reading too much in a central banker’s unavoidably cryptic statements. Draghi, Mario (2011) “Hearing before the Plenary of the European Parliament on the occasion of the adoption of the Resolution on the ECB’s 2010 Annual Report”, ECB. Draghi, Mario (2012), speech by Mario Draghi, President of the European Central Bank at the Global Investment Conference in London, 26 July 2012, ECB Wyplosz, Charles (2011) “A failsafe way to end the Eurozone crisis”, 26 September 2011, VoxEU. Wyplosz, Charles (2012) “The ECB’s trillion euro bet”, 13 February 2012, VoxEU. The compact is too imprecise to guarantee fiscal discipline. Yet, it is a historical decision, even if it will need to be improved upon. It matters a lot that the European Parliament be treated with the respect that it deserves in its capacity as the only official institution to which the ECB is accountable. This too is a welcome change.